Life Before the Dinosaurs: Hurdia. Hurdia was a one-and-a-half foot anomalocarid found in the Burgess Shale. Like its relative Anomalocaris, it was mistaken for other creatures such as shrimp, sea cucumbers, and jellyfish. It had a wide, flat telson at the end, which was probably strong and could push Hurdia through the water very quickly to catch prey. There is only one species of Hurdia, Hurdia victoria. Hurdia had a pointed head structure, but the use for this structure is unknown. The head shield was hollow, which may have been used to move Hurdia up and down like a submarine. But this is just a guess, because no one really knows if this is what Hurdia really used its hollow head shield for. 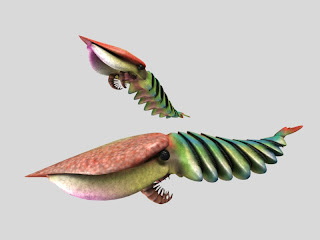 Unlike its relative Anomalocaris and many other anomalocarids, Hurdia did not have swimmers on the sides of its body. Scientists don't know what Hurdia had been eating, because no one has found anything from the gut or any feces of Hurdia. But Hurdia probably was one of the top predators, and ate things like trilobites, worms, and even other anomalocarids. This is a very interesting post. 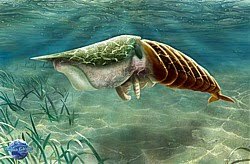 I think this is one of the coolest blogs around, and I agree that ancient life forms are fascinating. Thanks so much! Is this critter one of the Burgess Shale specimens? You are the most awesome 7 year old in the world! I love all the flora and fauna before the dinosaurs - I even have the little plastic figures of Burgess Shale life that a museum in Ontario put out a couple of years ago. I have Wiwaxia, a trilobite, anomalocaris and a few others. Please keep writing this blog, because more people need to know about all the cool stuff that existed before the dinosaurs! Thanks to everybody. You are saying some really nice things that I really love. So thanks!!!!!!!!!!!!!!!!!!!! You totally rock. Keep up the great work! Art, first let me offer my congratulations to you and your blog. What you are doing is rare from any age. There is far too little information online about pre-dinosaur life. My fiancé and I are avid amateur fossil hunters whose interest lies in the Carboniferous Period and earlier. So far we have traveled to four states and Mexico and have collected specimens from the Devonian, Silurian, Ordovician, and Carboniferous Periods. We have also collected some Eocene specimens from the Yucatan in Mexico. Ironically we were only about 100 miles from where the asteroid hit that helped to wipe out the dinosaurs. Keep the great blog and don't lose your passion!! @Anonymous That's cool that you were able to find fossils from the Ordovician, Silurian, Carboniferous, and Devonian periods. I would like to do that too! These scientifically accurate toys are based on the half-billion-year-old fossils of the Burgess Shale from the Canadian Rockies of British Columbia. The ancestors of all animal groups appeared in the greatest evolutionary explosion of all time – the Big Bang of evolution – 500 million years ago. The best view we have of these first animal communities on Earth exists in the Burgess Shale fossils first discovered on Mt. Stephen in 1886. In 1975, Dr. Desmond Collins led the first ROM expedition to the Burgess Shale. He returned for 18 seasons and discovered new Burgess Shale fossil sites and collected many thousands of unique and bizarre fossils. Prices above do not include shipping and applicable taxes. Shipping and taxes are calculated at the time of purchase. The complete set of five toys is sold in a presentation box. The toys are not sold individually. Can you tell me where you got the third illustration of Hurdia on this page please? The images themselves are links back to their source. Unfortunately, a lot of artists do not put their names on their work, so it is often impossible to discover who created particular images.